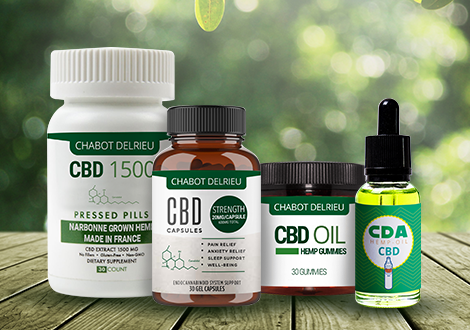 The new French legislation regarding products made from Cannabidiol (CBD) combined with an increasing popularity and consumption lead to a constant rise of demand. Facing this success and in order to respond to the packaging and manufacturing rise, in an efficient way, CDA offers you the labelling machine (automatic, semi-automatic), the filling machine (automatic, semi-automatic), or the packaging integral design adapted to your CBD product format. The CBD product range is extremely wide : CBD e-liquid, CBD oil, CBD resin, CBD ointment, CBD cream and balm, CBD massage oil, CBD coffee, CBD tea and infusion, CBD crystals, etc. Those different products, whether it be cosmetics, dietary or for e-cigarette use, are various in terms of container and packaging: flask, bottle, pot, box, tin, etc. Manufacturer for 30 years of labelling solutions, filling solutions and integral design, CDA will guide you in the automatic or semi-automatic packaging of your CBD products, whatever the format of your container or its material: glass, PET, etc. The CDA semi-automatic labelling machines are especially designed for adhesive label application on little productions. Adapted to every format (pots, bottles, tubes, flacks, boxes, etc. ), our semi-automatic labelling machines are particularly appreciated for their ease of use and robustness. For little formats, like e-liquid flask, CDA developed a “mini-kit” for the Ninette Auto labelling machine, which enables the labelling of flask starting from 10 ml. CDA automatic labelling machines are addressed to CBD product manufacturers looking for machines combining high speed and application accuracy. Whatever the speed wanted and the format to label, CDA offers you a wide range of automatic labelling machines for pots, bottles, flasks, etc. Our automatic labelling machines have from one to four labelling heads and can apply on any zone of your flat, cylindrical or conical containers: on the side, top or bottom of your container. For the filling of small quantity of liquid, viscous, pasty CBD products, CDA designed a range of precision semi-automatic filling machines suitable to every kind of liquid: e-liquid, cosmetic cream, ointment, oils, essential oils, etc. For the semi-automatic filling of small formats, like flask, CDA developed the K-ONE, semi-automatic filling machine with precision peristaltic filling pump. CDA automatic filling machines are particularly aimed at bottle or pot format filling. Equipped with one to four filling nozzles, a CDA automatic filling machine will be more suitable to CBD products manufacturer looking for packaging of containers from 250 ml to several litres. In order to improve you CBD products packaging, CDA offers you a complete range of complementary solutions: CBD products marking, automatic screw for every type of cap, automatic bottles feeder. The recent legislation concerning Cannabidiol-based products (CBD) combined with its success in different ways of use, cause a constant increase of the demand. For small quantities packaging, CBD products manufacturers naturally opt for semi-automoatic machines. This first investment, quickly amortised, will provide considerable time saving in packaging operations. It will also allow to reach the best precision possible for the filling as well as for the labelling. The packaging of CBD porducts average productions can no longer be guaranteed by semi-automatic equipment. Therefore, a partial or complete automation of the filling and labelling process is required. By their precision and robustness, the CDA automatic machines range allow to get the efficiency gain wanted. To fill, cork and label a large quantity of CBD products inevitably requires an investment in an integral design of packaging. In that case, the complete process automation is pursued. CDA teams developed global solutions, allowing the automation of the whole process, either via our E-FILL pack lines or via a custom-made packaging tool.